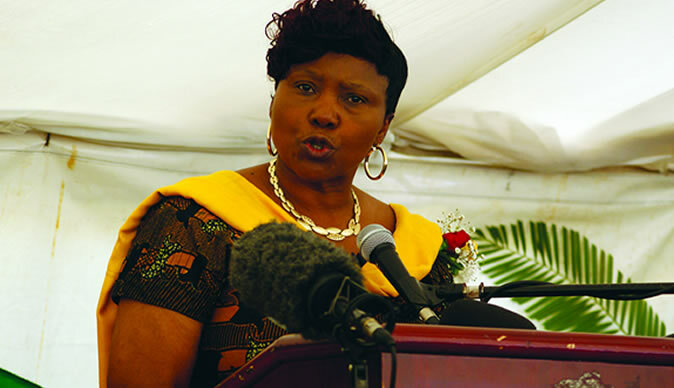 Defense Minister Oppah Muchinguri-Kushiri might outfox Vice President Constantino Nyikadzino Chiwenga to assume the Vice Presidency as infighting within ZANU PF rages on. This was revealed by self-styled communications strategist William Mutumanje on Monday. "There is a voice silent in all this but playing a very smart calculative game." Mutumanje said. "ZANU PF will self-preserve, they will do the needful to stay in power, but like musical chairs, one must go to save one. Don't underrate Oppah's ability to navigate the game. She was 1st choice VP." Muchinguri was rumoured to assume the Vice Presidency in November last year when Mnangagwa took over after a bloody coup that ended 38 years of Robert Mugabe's rule. Surprisingly, she was given the Minister of Defense and Chiwenga took the Vice Presidency. Mutumanje also confirmed that there is a power struggle between Mnangagwa and Chiwenga. "It's time! There is a power wrangle at the top. Mnangagwa doesn't want you know who, you know who doesn't want Mnangagwa. Between the two is also the battle to keep support from the financier (who is the most lucrative pipeline available for now)." He said. Former Deputy Minister of Finance Terence Mukupe and Gokwe-Nembudziya Member of Parliament Mayor Justice Wadyajena claimed that a faction of ZANU PF that want to remove President Emmerson Mnangagwa was threatening them for exposing their impeachment plot. Sources allege that there was a meeting of MPs to discuss the impeachment of Mnangagwa over the Weekend and the two were invited. After the meeting they then exposed the plot leading to President Mnangagwa dumping his trip to Davos, Switzerland and heading back home.